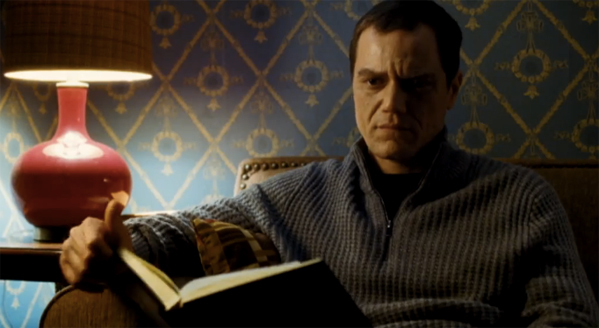 If Michael Shannon wasn't hamming it up enough for you in Man of Steel, then maybe it's time you see what he can do with a hokey, campy thriller called The Harvest. In what feels like a made-for-TV movie, albeit maybe intentionally, the first trailer for this film shows what appears to be the start of another lovely The Fault in Our Stars-esque relationship between a young girl and a bed-ridden, ill boy. But that's until the friendly girl learns that her new next door friend's parents (Michael Shannon and Samantha Morton) are hiding some sinister secrets next door. This looks like standard, forgettable thriller fare to me. Watch? The Harvest is directed by John McNaughton (Henry: Portait of a Serial Killer) and written by newcomer Stephen Lancellotti. Maryann (Natasha Calis) moves in with her grandparents after she’s orphaned. Desperately lonely, the preteen sets out to befriend a neighboring deathly ill, bed-ridden boy (Charlie Tahan), despite the outright disapproval of his mother (Samantha Morton). Maryann’s persistence pays off, however, and during a series of secret visits she gradually uncovers some seriously sinister goings-on in the house. Michael Shannon also stars in the film IFC Midnight releases on VOD and in theaters April 10th. This is on some Fritzel shitzel. I smell Munchausen by Proxy!! !